In 2005 Nexo and Yamaha announced the formation of a strategic alliance for product development and distribution, the first fruits of the collaboration are to be revealed at the PLASA exhibition 2007 in London. 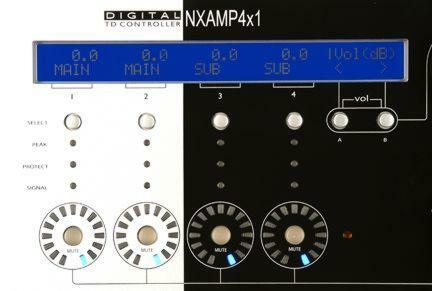 For the first time on the international stage, Nexo will unveil the NXAMP, a powered TD Controller. The integration of amplifier, available in two 4-channel sizes, with the NEXO TDController is a cool, clean and efficient solution which will bring cost and operational benefits to live use as well as fixed installation. The TDController function provides crossover, sensed amplifier control and system alignment, using digital software algorithms to combine this calibrated data with sensed voltage and current measurements, precisely controlling the temperature and displacement of each driver. The larger of the two NXAMPS displays exceptional output performance; one unit will power up to 16x NEXO PS15 loudspeakers. Combining the two functions in one device will save the expense of buying a processor as well as an amplifier, and it will also reduce the number of analogue-to-digital conversions required by discrete units. At PLASA, NEXO will also debut the first of its RS Subwoofer Series. There are three models in this new Series – 15”, 18” and 21”. Although it has been designed in tandem with the GEO S12 Series of loudspeakers, the RS15 is also intended for use with other NEXO system elements. Uniquely, the RS Subs can switch between cardioid and omnidirectional characteristics, simply by turning the cabinet vertically or horizontally. © 1997 © 2007 Pro-Music-News. All rights reserved. Thank you for visiting Pro-Music-News.